A judge has sentence a B.C. hockey coach who was caught on tape tripping a teenage player to 15 days in jail. A judge has sentenced a B.C. hockey coach who was caught on tape tripping a teenage player to 15 days in jail and 12 months of probation. Martin Tremblay, 48, was filmed knocking the skates out from underneath a 13-year-old hockey player with his foot following a game at UBC's Thunderbird Arena last June. The boy broke his wrist and fell into a 10-year-old player. The incident was recorded on video by someone watching in the stands, and then drew national attention after it was posted online to YouTube. Tuesday’s jail sentence came as a surprise to Tremblay, who pleaded guilty to two counts of assault in November. His lawyer, Robert Bellows, said he would not be making an appeal. Judge Patrick Chen said Tremblay had abused his position of trust as a coach and compared his move to a "cowardly sucker punch." 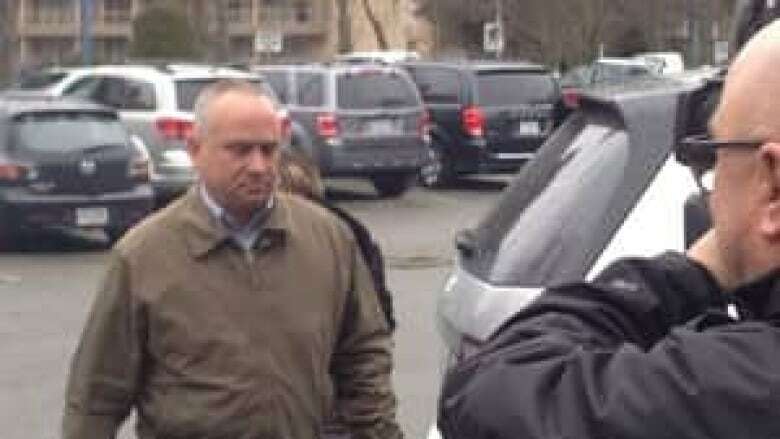 "He’s rebuilding his life after this incident," Bellows told reporters outside the courthouse in Richmond, B.C., on Tuesday. It was unlikely, Bellows said, that Tremblay would ever coach hockey again. "It’s horrible. He put in years and years coaching hockey, he put in years and years as a scout master. And that all over … because of one incident when he was off his antidepressants for three weeks." Bellows had asked the judge for a suspended sentence, saying his client was under a lot of pressure just before he committed the offence and that he had written a letter of apology asking for the victim's forgiveness. The Crown had asked for a sentence of 30 days of house arrest and 18 months of probation. Tremblay's first day in jail will be today and will serve out the rest of his 15-day sentence intermittently on weekends.